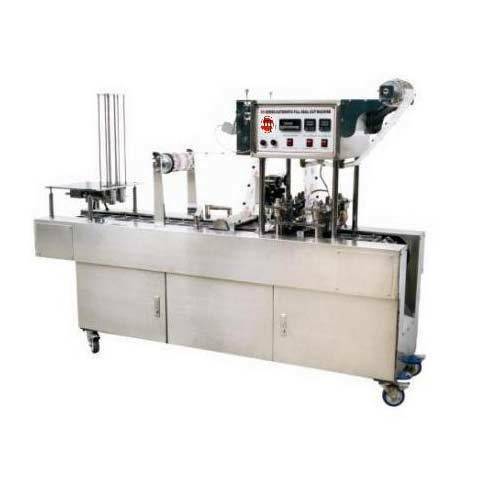 Our clients can avail from us a wide range of automatic Cup/Glass Filling & Sealing Machines (model no. NBCRF - 95) that is used for washing, filling and sealing purposes. The features that make these machines highly effective is that it can automatically wash, fill, seal, cut, print the code, sterilize in UV radiation and falling cup. It is due to the high utility of this machine that it is preferred in various industries such as pharmaceutical, bottling, food processing, steel, cement, tyre and fertilizer. We also check our range on parameters such as performance, durability, energy consumption and ease of use to ensure maximum client satisfaction. We have a team of diligent professionals who undertake innovative tasks and help us in developing new designs in accordance with international standards. Our well equipped infrastructure enables us to meet the variegated requirements of our clients. Further, our logistic services help in swift and prompt delivery. Our capability to customize the entire range has helped us in garnering a spread out client base across the globe.